President Barack Obama interview with George Stephanopoulos of ABC This Week in the Roosevelt Room of the White House, Sept. 18, 2009. 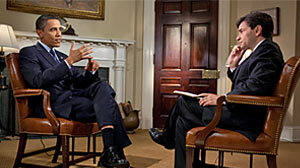 ABC NEWS, THIS WEEK WITH GEORGE STEPHANOPOULOS INTERVIEW WITH PRESIDENT BARACK OBAMA. GEORGE STEPHANOPOULOS, HOST: Mr. President, thank you very much. BARACK OBAMA, PRESIDENT OF THE UNITED STATES: Thank you, George. STEPHANOPOULOS: Probably the most definitive promise you made in the campaign is that no one in the middle class would get a tax increase on your watch. STEPHANOPOULOS: Yet this week, Senator Rockefeller and several other Democrats say that this bill by Senator Baucus is a big middle class tax increase. Do you agree and does that mean you can't sign it? OBAMA: Well, I don't agree. I think that what they were referring to – and I haven't looked at the quotes. But I think that they were concerned about whether or not this was actually affordable. If you're saying to people, you've got to get health insurance but they can't actually afford it and they have to pay a penalty if they don't get it, then that's a pretty big burden on middle class families. That's a concern I share -- making sure that this is affordable. But the first thing we've got to understand is you've got what is effectively a tax increase taking place on American families right now. The Kaiser Family Foundation report just came out last week. Health care premiums went up 5.5 percent last year, at a time when the rest of the economy, inflation was actually negative. So that is a huge bite out of people's pockets. OBAMA: And so -- and so -- just -- just to close the loop on this, the principles I've put forward very clearly, when I spoke to the joint session of Congress, is that we're going to make sure that, number one, if you don't have health insurance, you're going to be able to get affordable health insurance. Number two, if you have health insurance, we're going to have insurance reforms that give you more security -- you know what you're going to get. You know that if you're paying your premiums, you're actually going to have coverage when you get sick. Number three, it's going to be deficit neutral -- it's not going to add a dime to the deficit, now or in the future. Number four, it's going to start driving down our costs over the long-term. Now, 80 percent of what I'd like to see is actually already in all the various bills that are in Congress. That last 20 percent is tough because we've got to figure out -- making sure that we're paying for it properly, making sure that it really is relief to families who don't have health insurance, making sure that all the various details that are out there line up. And that's going to take some time. STEPHANOPOULOS: Hasn't signed on yet, though. OBAMA: Hasn't signed on, but has said that this is a legitimate effort to try to solve the problem. What I want to see is that we just keep on working on it over the next several weeks. STEPHANOPOULOS: How about a matter of first principles, though. You mentioned these premium increases. STEPHANOPOULOS: But they're not happening as a result of a decision by the government. OBAMA: Well, hold on a second, George. Here -- here's what's happening. You and I are both paying $900, on average -- our families -- in higher premiums because of uncompensated care. Now what I've said is that if you can't afford health insurance, you certainly shouldn't be punished for that. That's just piling on. OBAMA: No. That's not true, George. The -- for us to say that you've got to take a responsibility to get health insurance is absolutely not a tax increase. What it's saying is, is that we're not going to have other people carrying your burdens for you anymore than the fact that right now everybody in America, just about, has to get auto insurance. Nobody considers that a tax increase. People say to themselves, that is a fair way to make sure that if you hit my car, that I'm not covering all the costs. STEPHANOPOULOS: I -- I don't think I'm making it up. Merriam Webster's Dictionary: Tax -- "a charge, usually of money, imposed by authority on persons or property for public purposes." OBAMA: My critics say everything is a tax increase. My critics say that I'm taking over every sector of the economy. You know that. STEPHANOPOULOS: ...are going to force people to lose coverage they now have. OBAMA: No. Here -- here's what's going to happen. These are essentially private HMOs who are getting, on average -- and this is not my estimate, this is Democrats and Republicans, experts have said -- they're getting, on average, about 14 percent more over payments, basically subsidies from taxpayers for a program that ordinary Medicare does just as good, if not better, at keeping people healthy. Now, they package these things in ways that, in some cases, may make it more convenient for some consumers, but they're overcharging massively for it. There's no competitive bidding under the process. OBAMA: …Why don't we make sure that we're using some of that money to actually make people healthier? STEPHANOPOULOS: But he said it's going to cause beneficiaries right now to lose what they have. OBAMA: Look, I understand that change is hard. If what you're saying is that people who are currently signed up for Medicare advantage are going to have Medicare and the same level of benefits, but they may not be having their insurer get a 14 percent premium, that's absolutely true and will the insurers squawk? You bet. STEPHANOPOULOS: They may drop the coverage. OBAMA: No, these folks are going to be able to get Medicare that is just as good, provides the same benefits, but we're not subsidizing them for $18 billion a year. STEPHANOPOULOS: So Senator Nelson, he wants to pass an amendment that shields anyone currently on Medicare advantage from any cuts. Do you support that? OBAMA: George, I'm not going to be negotiating a particular provision of the bill, sitting (ph) down with you here right now. What I am going to say is this: the basic principle that is indisputable is that we are wasting hundreds of billions of dollars in Medicare that is not making people healthier. I want to make sure that we're using that money to actually make people healthier. STEPHANOPOULOS: But if people lose their Medicare advantage? OBAMA: What I have said is we're not going to take a dollar out of the Medicare trust fund. We're going to make sure that benefits are just as strong if not stronger. We're not going to subsidize insurance companies in ways that end up creating a situation that Medicare is actually weaker and has a less financial foundation, because right now, we've got eight years from now potentially Medicare going into the red. STEPHANOPOULOS: Let me ask you about the broader debate around this – and you've seen a lot of your allies look at this whole debate around healthcare… and see the issue of race being injected after Joe Wilson's outburst. This week, President Carter. I know you disagree with that - that race is involved here. And you know we've talked about this in several interviews, about these kinds of issues, and you always dismiss it. So I'm just wondering: Does it frustrate you when your own supporters see racism when you don't think it exists? OBAMA: Look, I think that race is such a volatile issue in this society. Always has been. That it becomes hard for people to separate out race being sort of a -- part of the backdrop of American society versus race being a predominant factor in any given debate. And what I've said, what we talked about during the campaign, are there some people who don't like me because of my race? I'm sure there are. Are there some people who vote for me only because of my race? There are probably some of those too. The overwhelming part of the American population I think is right now following the debate and trying to figure out is this going to help me? Is health care going to make me better off? Now there's some who, setting aside the issue of race, actually I think are more passionate about the idea of whether government can do anything right. And I think that that's probably the biggest driver of some of the vitriol right now. STEPHANOPOULOS: Whether you're going to raise their taxes. OBAMA: Well, it goes beyond taxes. I mean I think that what we're seeing right now is a part of a running debate that we saw during FDR, we saw during Ronald Reagan, anytime there's a president who is proposing big changes that seem to implicate (ph) the size of government, that gets everybody's juices flowing and sometimes you get some pretty noisy debate. But -- but just to finish the thought. I think what I'm proposing is a very modest attempt to make sure that hard-working families out there are going to have the security of health insurance that they can count on. This isn't a radical plan. This isn't grafting a single payer model onto the United States. It's simply trying to deal with what everybody acknowledges is a big problem. I think that there are some opponents who have used -- seized on this and tried to use this as a proxy for saying that somehow we are vastly expanding government and taking over every sector of the economy. OBAMA: I think they're wrong. The one thing I hope is, is that we can have a civil argument about it and that we are able to acknowledge good motives on both sides. Everybody is a patriot. Each of us are Americans that care deeply about this country. And -- and sometimes I think that, frankly, the media encourages some of the outliers in behavior, because, let's face it, the easiest way to get on television right now is to be really rude. If you're just being sensible and giving people the benefit of the doubt and you're making your arguments, you don't -- you don't get -- you don't get time on the nightly news. OBAMA: But if you -- if you say something outrageous, you're there in a hot second. OBAMA: Well, look, the -- you know, I think that -- are there folks in the Democratic camp or on the left who haven't -- haven't always operated ways that I'd appreciate? STEPHANOPOULOS: ...all funding for ACORN. OBAMA: You know, if -- frankly, it's not really something I've followed closely. I didn't even know that ACORN was getting a whole lot of federal money. STEPHANOPOULOS: So you're not committing to -- to cut off the federal funding? OBAMA: George, this is not the biggest issue facing the country. It's not something I'm paying a lot of attention to. STEPHANOPOULOS: Afghanistan is a big issue facing the country right now. OBAMA: That is a big issue. That's worth talking about. STEPHANOPOULOS: You were for a flexible time line in Iraq. Some people now are saying that's exactly what should happen in Afghanistan if the same conditions hold. OBAMA: Here's what I think. When we came in, basically, there had been drift in our Afghan strategy. Everybody acknowledges that. And I ordered a top to bottom review. The most important thing I wanted was us to refocus on why we're there. We're there because al Qaeda killed 3,000 Americans and we cannot allow extremists who want to do violence to the United States to be able to operate with impunity. Now, I think we've lost -- we lost that focus for a while and you started seeing a – a classic case of mission creep where we're just there and we start taking on a whole bunch of different missions. I wanted to narrow it. I did order 21,000 additional troops there to make sure that we could secure the election, because I thought that was important. That was before the review was completed. I also said after the election I want to do another review. We've just gotten those 21,000 in. General McChrystal, who's only been there a few months, has done his own assessment. I am now going to take all this information and we're going to test whatever resources we have against our strategy, which is if by sending young men and women into harm's way, we are defeating al Qaeda and -- and that can be shown to a skeptical audience, namely me -- somebody who is always asking hard questions about deploying troops, then we will do what's required to keep the American people safe. OBAMA: Now, the -- the only thing I want to say, though, is -- is that what we – I just want to make sure that everybody understands that you don't make decisions about resources before you have the strategy ready. STEPHANOPOULOS: I just have time for one final question. I'm sure you know the story about John Kennedy's first summit with Nikita Khrushchev back in his first year in office. STEPHANOPOULOS: He meets with Khrushchev. Khrushchev cleans his clock. STEPHANOPOULOS: Kennedy walks out and knows that's exactly what's happened. I know you -- there are no perfect analogies, but what's the moment, in the last eight months, where you took a step back and said: 'Wow, I'm going to have to step up my game'? OBAMA: You know, it's an interesting question. I -- I mean I don't mean to be immodest here, but I don't think I've had that moment with a -- with a world leader, where I said gee, you know -- you know, we've got to really tighten things up. OBAMA: Well, not so much lost control, but where I've said to myself, somehow I'm not breaking through. And -- and it's not -- you know, I know my critics would just say well, it's because you -- you know, the plan is just, you know, the -- the wrong one. But it's -- it -- that's not so much it. It's -- this has been a sufficiently tough, complicated issue with so many moving parts that, you know, no matter how much I've -- I've tried to keep it digestible, you know, it's very hard for people to get their -- their whole arms around it. And that's been a case where I have been humbled and I just keep on trying harder, because I -- I really think it's the right thing to do for the country. STEPHANOPOULOS: Thanks very much for sitting with us. OBAMA: Great to talk to you. Thank you. STEPHANOPOULOS: President Obama trying harder to communicate on health care. STEPHANOPOULOS: Let's talk to the roundtable about all this now. I am joined, as always, by George Will, Peggy Noonan of the Wall Street Journal, Bob Reich of Berkeley and the American Prospect, former Bush strategist, Republican strategist Ed Gillespie, and Donna Brazile. And, George, let's pick up on that last point with the president, a concession there from the president that he hasn't communicated as well as he'd hoped on health care. Is this blitz we're seeing the answer? WILL: I don't think so. I mean, it was a concession to avoid a bigger concession. Every president, when he has trouble selling an idea, says, "Nothing wrong with the idea. It's the packaging that's wrong. People have seen too little of me." And so he's -- he's acting in character with the office. But there is a fact -- there is an inverse relationship between the amount he speaks about health care and support for health care. And this week, George, something immense happened, and that is we got a big number. Actually, we got a little number. We deal with hundreds of billions and trillions of dollars in talking about this. The number that came out this week is 13 percent. They said 13 percent of a family's income, a family making $66,000 a year, about $15,000 over the median income, about 13 percent of their income under this plan would go for health care, not counting co-payments and not counting deductibles. STEPHANOPOULOS: ... like Jay Rockefeller. I want to get to more on the policy on health care later in the roundtable. But, Ed, let me bring you in here. I saw your former White House colleague, Dana Perino, say that what we've seen here is the president overexposed. Are you sure that's right? GILLESPIE: I think there's a lot to that. I mean, the fact is, four primetime press conferences in the course of this presidency, the joint session speech in primetime, Leno and various appearances, including this morning, and it's not moving the needle, I think because he's dissipated the impact of -- of presidential speech right now. STEPHANOPOULOS: When you say moving the needle, he didn't get a big bump out of the joint session speech, but it does appear that he's stabilized the numbers on health care. GILLESPIE: Well, according to ABC's own polls afterward, you have 54 percent who say the more they hear about it, the less they like it. You've got 78 percent who say that they think it's not going to benefit them in terms of affecting costs or make it worse. The 82 percent, I think it is, who say that it's not going to improve the quality of their care and probably make it worse. So I'm not sure he did. He may have -- he may have stemmed some bleeding, but I -- I think he's diminished the impact of his -- of his office a little bit with the overexposure. BRAZILE: I don't think he's overexposed, George. I think he is not only an effective communicator, but the president is -- is now in the final months of his first year in office. And he's clearly trying to get through his message through all the clutter, the new media, the old media, and everything in between, and this is an opportunity for the president to orchestrate what I believe is the most important phase of this health care debate and other debates, and that is to make sure that he can find a less chaotic path to the passage. So by communicating, by getting his message out through this clutter, I think the president is once again demonstrating leadership. And this is a very important time for him. STEPHANOPOULOS: Peggy, one of -- one of the arguments the White House makes is that they're dealing with a very different media environment than any other president ever had to deal with. It's such a fractured media environment that in -- and that even someone like Ronald Reagan, who you worked for, would have to do more of what you're seeing the president do in this environment. STEPHANOPOULOS: No one's going to turn him down. NOONAN: ... because this is his way, because everybody will say yes. I don't think it's about the media environment, but I do think the media environment allows a modern leader to be something subtly damaging, and that is boorish. They get their face in your face every day, all the time. It's boorish, and it makes people not lean towards you, but lean away from you, no matter what the merits of the issue, and the merits of this issue are not such great merits. REICH: Well, but -- but, you know, this is an interesting point. My -- my calculation is that, at the end of today, the president will have appeared, in terms of national print and broadcast media, about 124 times, up to this point in his -- in his -- in his term. STEPHANOPOULOS: Thanks to Mark Knoller of CBS. REICH: Well, it's extraordinary. But Bill Clinton by this time, I think the number was 47, or something like that. George W. Bush was 40. I mean, this is -- this is a president who is very exposed, our current president, but he's the educator-in-chief. I mean, if he weren't effective at doing this, he would not be doing this. And, Ed, let me go back to something you said. The polls are over the place in terms of effectiveness. That CBS poll showed a very substantial increase after he gave that speech to the joint session of Congress. GILLESPIE: But I think it was a bump. It wasn't lasting. REICH: Well, but we can call -- can call it a bump. We can call it an increase. The point is that he is and he had to after August take the initiative again. He is taking the initiative. He knows that if there's any lull right now, his opponents are going to jump into that lull. And it's very important that he educate the public about what's going on. STEPHANOPOULOS: Let me jump in right here, because we're going to have to take a break. We've got a lot of time on the back end of these commercials, a lot more to talk about. We'll be right back with the roundtable and the Sunday funnies. CARTER: An overwhelming portion of the intensely demonstrated animosity toward President Barack Obama is based on the fact that he is a black man. BECK: We have a former president who says, if you're opposed to the president's health care, you're a racist. LIMBAUGH: The left looks at everything through a racial prism. I'm just -- I'm just -- hey, they hit us, we hit back twice as hard. PELOSI: In the late '70s in San Francisco, this kind of -- of rhetoric was very frightening. And it gave -- it created a climate in which we -- violence took place. STEPHANOPOULOS: The debate not coming down (ph) as President Obama called for. Let me bring the roundtable back in. I'm joined by George Will, Peggy Noonan, Bob Reich, Ed Gillespie, and Donna Brazile. And, George, as we -- as we get to this, let me show two magazine covers from this week. First, Time magazine, Glenn Beck, mad man, and the angry style of American politics. And then in the New York magazine coming out tomorrow, there's the tattooed face of Barack Obama, big headline, "Hate." We -- we heard President Obama say he thinks that a lot of anti- government feeling, the idea that the government can't do anything right, is behind all this. What's your theory? STEPHANOPOULOS: Donna? BRAZILE: Well, George, there's some evidence that -- not an overwhelming amount of evidence -- that some of -- a small fringe of this movement, clearly there's some racism. And you don't have to know the motives of someone's heart to understand when you see signs, incendiary signs that basically compares him to a witch doctor, an African heathen. We know racism; we don't have to be told or taught that. That -- that much we do know. There's a culture of extremism that has gained mainstream acceptance. And I think the president is absolutely right. When you see it, you have to call it. You shouldn't duck it. But, on the other hand, you shouldn't exaggerate it. This is why we need responsible leaders to denounce it, but more importantly, we need to find a way to have an honest and good dialogue whenever race is a topic so that the president of the United States, which is very busy, does not have to have beer summits all the time. NOONAN: You know what I think? When I look at this, I step back a little bit and I think, "There is a lot of anger now." Mrs. Pelosi had a point. Things get high. It's always good to cool things down. But, essentially, what we have here is a very new president. He's only been here for 10 months. He is a young man. He didn't have deep, long, profound experience. He is attempting right now to change, what is it, 17 percent, 18 percent of the GNP of the United States of America, changing how it works, health care. This is problematic on the face of it. People will argue about that. But on top of that, people are thinking about -- in America -- the economy, unemployment, war and peace, two wars that are going. NOONAN: ... and it angers people. STEPHANOPOULOS: Well, and that -- and, Bob, Bill Clinton faced the similar -- and Hillary Clinton faced similar kinds of anger in 1993 when they put health care forward, as well. REICH: Yes. The difference, though, I think -- and, by the way, I think Donna is absolutely right. There is some element of racism here. You can't avoid it. The question is whether it's the dominant element. I don't think it is the dominant element. I think Peggy put her finger on it just now, and that is, when 1 out of 6 Americans is underemployed -- either unemployed or underemployed -- and when you have about 1 out of 3 Americans worried that they could be, there is an element of anxiety and fear in the population right now that demagogues either on the right or left will almost inevitably use to position themselves. The politics of resentment is something we've seen before in this country. Right now, you have right-wing talk radio people who are whipping it up, not just against the president, but against foreigners, against immigrants, against blacks, against elites. This is what happens in this country when people are scared. STEPHANOPOULOS: But -- that's true, and it's -- but it's right and left. You know, Ed, I was struck this week -- I spent an evening flipping between Fox News and MSNBC. And it's like you were living in parallel universes. They are basically taking completely different takes on a similar issue to just attack each other and not -- and not really look at -- look at the problem. GILLESPIE: Well, this is to your point, George. STEPHANOPOULOS: I'll probably get attacked for that, but go ahead. GILLESPIE: Well, you have a -- you have a fractionalized media today, which reflects the new environment in which the debate takes place. And I do think there's a pull from the left and the right, whether it's talk radio or blogs. But, look, I think, as Donna said, you know, responsible leaders in both parties need to note a couple things. One is, when you -- you know, you make cheap comparisons to Adolf Hitler from -- from the right with the president or when you inject charges of racism where there -- where it's not evident, where people may have legitimate concerns about intervention in their health care, which is a very personal matter, you inflame an already impassioned debate. STEPHANOPOULOS: Let's -- let's get to that, because, George Will, you brought it up right at the top, that when people started to look at this bill by Max Baucus, the Senate finance chairman, this week, they looked at some of the provisions. And for some middle- class families in the $66,000 to $100,000 range, 13 percent of their incomes will be going to premiums before they go to co-pays and deductibles. And -- and, Bob Reich, this is something that it was interesting, Democrats pounced on this. REICH: Jay Rockefeller and other Democrats. You know, I think that the Baucus bill, you know, as a professor grading papers, I would grade it somewhere between a D and an F.
WILL: No grade inflation there. REICH: But -- there's no grade inflation. But, look, it's the beginning point. I think it is -- this is the dance of legislation. Over the next month-and-a-half, we're going to see the Democrats in the House come out with a very different bill. We're going to see something go to the Senate as a whole. We don't know exactly what it is. We're going to see a lot of negotiation in the Senate Finance Committee itself. Is this a good place to begin? I would say it's not ideal, but it's at least a place to begin. I think the momentum for health care is such that we are going to get a health care bill on the president's desk that he will be comfortable about signing this fall. REICH: And it keeps -- and it keeps the insurers and the drug companies and all the opponents traditionally inside the box. STEPHANOPOULOS: And doesn't increase the deficit. But let me bring this question to George Will. If you start to address these concerns over affordability and cost, will the president's overall red line of it's not allowed to increase the deficit be met? WILL: Of course not. The reason this meets that no increase in the deficit are really two things. First, it lowers the subsidies for people who are being compelled to buy health insurance. Now, that's why you get to the 13 percent of their income they're going to spend on that. And, of course, subsequent Congresses will simply raise the subsidies and blow the deficit off. Second, the president says it's -- it's not going to add to the deficit, because Congress is going to cut Medicare by hundreds of billions of dollars. No, it isn't. BRAZILE: Well, look, first of all, I think the Baucus bill is the floor, not the ceiling. And it's -- it gives the party a framework to make the bill better. I agree that I would not give it a wonderful grade initially, as well. But it allows the Democrats to really have a framework to make it a stronger bill. And if the Republicans decide to continue to stay on the sideline, then the Democrats will have to really have a good inside game to get this bill through. STEPHANOPOULOS: Republicans, all but one, Peggy, I couldn't help but notice in -- in the president's opening answer on health care, he -- he knew he was going to work in his courtship of Senator Olympia Snowe of Maine, one of the most powerful people in Washington right now. STEPHANOPOULOS: I don't think she knows yet. NOONAN: ... into that. I -- I wonder. There is much to be gained if she becomes part of something that is good, but it is hard to believe a really good bill is going to come out of this. STEPHANOPOULOS: She's still in the game, no? STEPHANOPOULOS: Well, it has to at this point, doesn't it? GILLESPIE: I suspect it does. And I think that brings us to a point, George -- I think it makes it very tough for Olympia Snowe at that point to try to stay with it. She has said in the past that she will not be the sole Republican to support legislation. But let me just say, they seem to be heading toward the -- the so-called nuclear option, going to the floor and trying to jam it through in the reconciliation process. I think that is a huge threat to this president and his greatest attribute politically, which is this still aura of post-partisanship. He will become at that point a very partisan Democrat. BRAZILE: But -- but let me just say this. Bipartisanship was always the goal. When you accept Republican amendments in the House and the Senate and try to bring Republicans aboard, as Chairman Baucus has tried to do, look, he took out the public option to gain Republican support. He -- he gave them interstate marketability. BRAZILE: He's doing everything to try to bring Republicans along, but the Republicans don't want to come along. REICH: You know, Mitch -- Mitch McConnell continues to say to the Republicans, "Don't go along at all." Olympia Snowe is very, very important to give cover to some of the more conservative Democrats, both in the House and the Senate. REICH: Because -- because it's -- you know, her being there basically allows them to say, well, there are some Republicans there. STEPHANOPOULOS: But, Bob, I can see the question of George before (ph). If you -- if you -- and it might be the right thing to do, but if -- if these provisions that Jay Rockefeller and others are calling for to add money back into the bill come through, then Doug Elmendorf is going to have to make another judgment. And will he still find that the bill is deficit neutral? REICH: ... and they will find nothing, because there's no analogy. REICH: ... it's going to get that cost curve under control. It has to. It has to. GILLESPIE: You know, there's a lot of focus on the Medicare aspect of this, George, but there's a big Medicaid aspect of it, too, that I think is lying in the weeds on this. And -- and the governors themselves, who are in cash crunches all across the country, this shift of a huge chunk of the federal Medicaid burden to the states, I think, is going to be one of the hidden things here that -- where people stand up and say, "Wait, we can't do that," and it's going to lead to a lot of problems in terms of that deficit number. STEPHANOPOULOS: Let me -- let me (inaudible) on that, because you said get out of the twigs. And you write, one, get out of the twigs on the policy side, also on the political side. When Democrats, Peggy, take a step back, they say, "We're not going to fail because we can't fail. It's simply too catastrophic to the president to -- to fail on health care." Yet you get into the weeds of the -- of the actual detail line by line of the policy, and you don't see something that there's a majority support for, at least not yet. NOONAN: I think what normal people watching what is going on in Washington think, to step back, is that, oh, they -- the people in Washington -- are going to make government bigger now. They're going to make it more expensive now. And they're going to make it more intrusive in my life, forcing me to buy, say, insurance if I don't want to or a penalty if I don't. Do I want that now, with the economy in the shape it's in and with being worried about my nephew, who's over in Afghanistan and is he coming back? No, I don't think that's where people are. I think the president will get something. I think he will win. There will be a headline that says, "Obama gets health insurance," or whatever he gets, however it's put, but I think it will be a sort of victory that makes people think, "That's not what we need." BRAZILE: Well, you know, the other flipside of that, of course, is that the status quo is untenable. We're paying more in premiums -- I think the president said $900; I've seen estimates at $1,100 -- additional dollars in uncompensated care, 45,000 people lose their health insurance -- 45,000 -- Americans are dying each year because they lack health insurance, just 1 out of 12 Americans. NOONAN: How about you do portability and tort reform and the Republicans are on board, and it's bipartisan, and the American government did it, and Obama still gets, "Obama wins"? REICH: Because, Peggy, with due respect, that does nothing about the fact that most Americans are paying through their nose now for co- payments, deductibles and premiums on a scale that they cannot possibly afford in the future. REICH: It's not just costs. It's also making this the most -- the most inefficient insurance system in the world. We all know that. Now, look, Franklin D. Roosevelt decided not to add health care to the New Deal. Why? Because he said to his colleagues, "I can't explain it. It's too complicated." REICH: Exactly. Exactly. I mean, this -- this -- we have now one of the best communicators we've ever had, the educator-in-chief. That's why he's all over the media. We haven't listened to him. STEPHANOPOULOS: Let's also -- before we go -- talk about something else the president brought up there. And, George, I heard a little bit of news as I was talking to the president about Afghanistan, saying for the first time, I believe, he is skeptical of the idea of sending more troops to Afghanistan. This comes in a week where his chairman of the Joint Chiefs of Staff was before the Congress saying more troops are probably going to be necessary. WILL: ... because of the Afghan winter, the run-off, if there is one, because of the corruption that we failed to secure the elections against, we may have six months effectively without leadership in Kabul. Third, he said to you his aim is to narrow the mission. What General McChrystal is trying to do is broaden it, at least in turns of the manpower-intensive nature of it, to protect the population, not narrowed, not secured. STEPHANOPOULOS: That -- that is the dilemma. The president has a narrow goal of stopping Al Qaida, but a very broad mission, this counterinsurgency mission that McChrystal has come up with. He actually fired his previous commander in order to get McChrystal in there. So doesn't that mean he almost has to approve what McChrystal comes back with? STEPHANOPOULOS: ... the timeline and just, you know, tries to buy some time and just doesn't immediately add more troops? GILLESPIE: Then you're out there in the middle of the road. It's the wrong place to be on this. REICH: This is a classic example of mission creep, and we've seen this again and again. The president knows this. He mentioned that to you. He said mission creep. He used those words. The problem is that, if he follows the Joint Chiefs of Staff, who said this week, look, I want a major increase, a huge increase, more than McChrystal is talking about, we could get bogged down in Afghanistan forever. The goal here, remember, is Al Qaida. Al Qaida is moving into Pakistan. Al Qaida can easily move its entire operations out of the -- of Afghanistan. What do we need to be in Afghanistan for? STEPHANOPOULOS: He -- the president said you simply can't take out Al Qaida with drones alone, as George Will has recommended. BRAZILE: And Senator Levin has made it clear that sending more troops without a very defined mission of perhaps training the Afghan army -- I mean, security forces and police is a non-starter. It's going to be a very tough sell on Capitol Hill. WILL: ABC poll this week said 66 percent of Republicans say we must win in Afghanistan, but 57 percent of those Republicans who say we must win said we should either decrease or hold level the forces in Afghanistan. The president -- the previous president said we will stand down as the Iraqi forces stand up. It took us six years to get to an army in Iraq of -- of 250,000 people. How long is it going to take in Afghanistan? NOONAN: Politically, when you look at Vietnam, you see the point at which Johnson's war became Nixon's war. I think the problem -- the political problem for Mr. Obama now is that Bush's war is becoming Obama's war. This is where things get really serious 10 months into his presidency. STEPHANOPOULOS: You know, a question was also, at what point did Kennedy's war become Johnson's war? And a lot of people look back at history and say, you know, there were inflection points. There were points when even though it might have been difficult, even though a president might have been accused of losing credibility, of not following through on his commitments, it might have been the wiser course to just say, "Enough is enough." GILLESPIE: May have been -- a flipside to that, if I could -- because when President Bush authorized the surge, public opinion was strongly against putting more troops into Iraq at the time. It worked. And the fact is, you have to, as a president and as commander-in-chief, make decisions regardless of the polls. President Obama has staked a claim that Afghanistan and success in Afghanistan is critical to our national security. If he changes that perspective and appears to have done so because of either pull from his left or poll results, I think it'll damage his presidency for the rest of his term. BRAZILE: Afghanistan is not Iraq. REICH: It's not poll results. It's -- it's more information about what is happening there. It's better information about what's happening there. It's the same as this change in his entire policy toward Russia. You know, all of these things are interactive. STEPHANOPOULOS: You know, George, I'm afraid that we're out of time. I want you guys to continue this -- continue this in the green room. You can check that out later on abcnews.com. And you can get political updates all week long from our daily newsletter. That's also on abcnews.com.